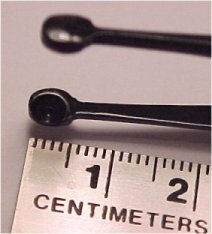 I vaguely remember a science teacher stating that a meter is just slightly longer than a yard, that the smallest marks on a meter stick are 1 mm apart, and that if one millimeter is used to represent ANYTHING, then one meter represents one thousand times as much. That's the point at which my non-mathematical mind just turned off, because it seemed to be getting dangerously close to Infinity or something, and ever since, I never have felt comfortable with precise measurements. Eyeballing or the good old inch/foot ruler is usually the way I go. However, sometimes in this hobby I need to use metrics, and even though a conversion chart hangs over my work table, when I look at it, I start thinking that I need to go eat chocolate instead. Finally, I realized I needed some comparisons that worked for me PERSONALLY so that when I look at my ruler, my poor little pea brain doesn't shut off. So I began measuring things in front of me on my worktable. One was a dime I use to show scale in photos. 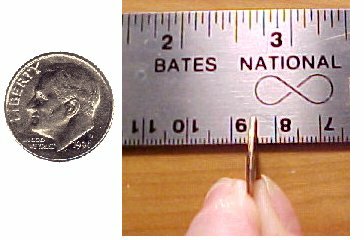 A mm (millimeter) is about the thickness of a dime. 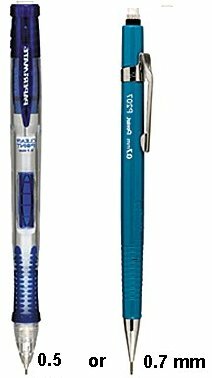 My mechanical pencil leads are usually .5 or .7 mm, or millimeters. 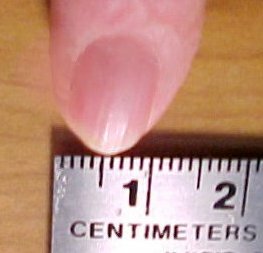 The width of my little finger tip is about a cm (centimeter). 10 millimeters = one centimeter. The cup of my bead tweezers is about half a centimeter. Since I DO remember that a meter is slightly over a yard, these few visual cues are usually enough for most of my trivial pursuits. I now keep these little photos with the conversion chart over my worktable. When I have to measure with my metric ruler, I look up at them first. It's not necessarily the best way to recall metrics; certainly not what woodworkers or draftsmen would do, for example. However, it works for me as an Open Sesame to my brain until something better comes along. I don't pretend to understand why I need help like this, but I do.